The classification of pancreatitis is difficult due to the inability to clearly separate acute and chronic pancreatitis. 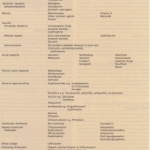 The original 1983 Marseilles classification was reviewed in 1984 and 1988 and simplified into acute and chronic forms. It was agreed that alcohol, which previously was classified as only causing chronic pancreatitis, can now cause the first episode acutely. By definition, acute pancreatitis may occur as isolated or as recurrent attacks. It is distinguished from chronic pancreatitis by the absence of continuing inflammation, irreversible structural changes and permanent loss of exocrine and endocrine pancreatic function. 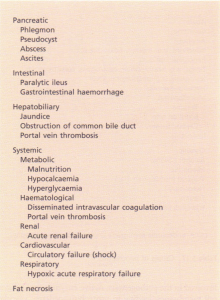 The causes of pancreatitis are shown. This is an acute condition presenting with abdominal pain and raised pancreatic enzymes in the blood or urine, due to inflammatory disease of the pancreas. 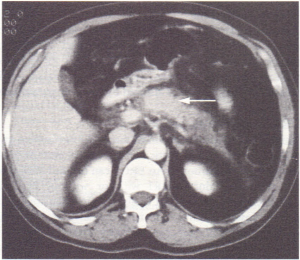 The exact mechanism by which pancreatic necrosis occurs is unclear. Associated gallstones are mainly found in the gallbladder and only occasionally in the common bile duct. Reflux of bile up the pancreatic duct associated with occlusion of the ampulla may playa role in the pathogenesis. Autodigestion of the pancreas by proteolytic enzymes (particularly trypsin and phospholipase A) released in the pancreas rather than in the intestinal lumen may also be involved in the pathogenesis. 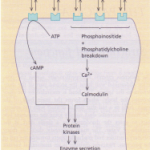 Active enzymes could digest cell membranes, leading to proteolysis, oedema, vascular damage and necrosis. The mildest form of pancreatitis is characterized by intestinal oedema with an inflammatory exudate (oedematous pancreatitis), while in the severe form there is pancreatic necrosis and haemorrhage (haemorrhagic pancreatitis). These vary depending on the severity of the attack. In all patients the principal symptom is abdominal pain that is usually localized to the epigastrium or upper abdomen. It may radiate to the back between the scapulae. The pain will vary from mild discomfort to excruciating pain in severe cases. Rarely, acute pancreatitis can occur in the absence of pain. Nausea and vomiting accompany the pain in most cases. In severe cases there may be multisystem failure and/or development of a complication, e.g. pseudocyst. Physical examination may reveal tenderness, guarding and rigidity of the abdomen, with varying degrees of shock depending on the severity of the attack. Rarely, body wall ecchymoses occur, e.g. umbilical (Cullen’s sign) or in the flanks (Grey Turner’s sign). The remaining clinical features depend on the local and systemic complications that occur. Local pancreatic complications can occur with mild attacks of pancreatitis but systemic complications only occur with severe attacks. The clinical manifestations are so varied that pancreatitis must be considered in the differential diagnosis of all causes of upper abdominal pain. Most present as an acute abdomen and differentiation from an acute perforated ulcer is the most difficult, as both may give rise to abdominal rigidity. 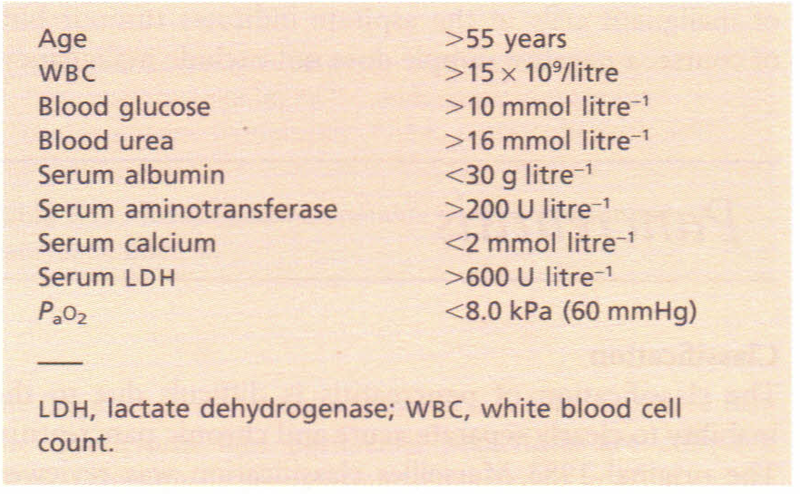 The diagnosis of acute pancreatitis depends on the serum amylase. A raised serum amylase level can be seen in other acute abdominal emergencies such as acute cholecystitis and perforated peptic ulcer, but if the serum amylase level is five times greater than normal, acute pancreatitis is very likely. However, the serum amylase cannot be entirely relied upon and must be evaluated in conjunction with the history and physical signs. A plain abdominal X-ray may show ileus initially limited to the loop of bowel (sentinel loop) or calcification in acute or chronic pancreatitis. If there is doubt about the diagnosis, exploratory laparotomy must be performed to exclude a potentially fatal but treatable non-pancreatic lesion. Peritoneal aspiration and lavage, with estimation of amylase in the peritoneal fluid obtained, is particularly useful in difficult cases. Ultrasound or contrast enhanced CT scan may reveal a swollen pancreas, sometimes with peri pancreatic fluid collections and gallstones, all of which help with the diagnosis. The differential diagnosis includes all acute abdominal conditions. Factors indicating the severity, which is assessed chiefly on blood investigations, are given . APACHE II score is also used to grade severity. Nasogastric suction is necessary to reduce vomiting and abdominal distension even in mild cases. All feeding isstopped and in severe cases nothing is given by mouth for weeks and intravenous nutrition is required. 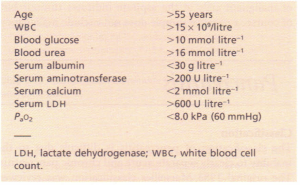 Factors during the first 48 hours that indicate severe pancreatitis and a poor prognosis. PHLEGMON. This is a solid inflammatory mass of pancreatic tissue that usually resolves spontaneously. PSEUDOCYSTS. Small pseudocysts are seen on ultrasound or CT in up to 50% of cases of severe pancreatitis, but do not usually require treatment per se. Large collections persisting for weeks can be aspirated under ultrasonic control or removed surgically. PANCREATIC ABSCESSES. 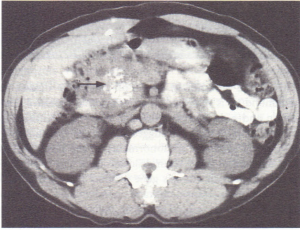 Secondary infection of a peri pancreatic collection of fluid may occur, usually after about 2 weeks. The clinical features are persistent fever, leucocytosis and abdominal distension, with a possible palpable mass. Patients are usually very ill with the accompanying respiratory, cardiac and renal problems. Drainage (either surgically or percutaneously under ultrasound or CT guidance) is performed with vigorous antibiotic therapy. General support of the patient is required, as the disease has a long clinical course of several months. PANCREATIC ASCITES. This is usually associated with chronic pancreatitis and has a high amylase content. The mortality rate varies from 1% in mild cases to 50% in severe cases. With multiple complications and the presence of all the bad prognostic signs, the mortality is nearer 100%. The patients who recover may have recurrent attacks, depending on the aetiology and whether accompanying gallstones are dealt with. This is defined as a continuing inflammatory disease of the pancreas characterized by irreversible morphological change and typically causing pain and/or permanent impairment of function. The majority of cases occur as a result of high alcohol consumption and it is in these cases that the pathology has been most studied. The earliest change appears to be deposition of protein plugs within pancreatic ducts. These then lead to ductular dilatation followed by acinar atrophy. There is some accompanying infiltration but this is variable. Extensive fibrous tissue is deposited near the pancreatic ducts. Eventually only a few acinar and islet cells remain, with widely dilated pancreatic ducts. Intraluminal calcification of the protein plugs occurs, leading to stone formation. There is controversy as to whether this results from repeated bouts of acute inflammation and necrosis or whether it is due to an insidious chronic process. Chronic pancreatitis is not reversible, but it is possible that the disease will arrest if the patient stops drinking. However, because patients often continue to take small amounts of alcohol, the disease is most often progressive. 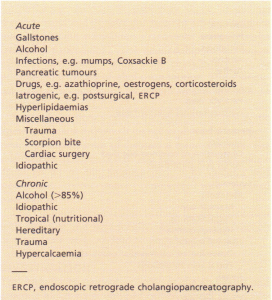 The causes of chronic pancreatitis are shown . Other suggested risk factors include excess smoking in males and an added risk factor of a low-protein and high-fat diet in alcohol abusers. The major symptom is abdominal pain situated mainly in the epigastrium and upper abdomen and radiating to the back. The pain can be severe; in some cases it is comparable to that occurring in acute pancreatitis. Continuing episodes of pain may occur; sometimes these are mild and of brief duration. In other cases there may be chronic pain interspersed with acute episodes (relapsing pancreatitis). The relationship to alcohol is variable; nevertheless, some acute episodes seem to be precipitated by heavy alcohol consumption. The abdominal pain is accompanied by severe weight loss due to anorexia. Steatorrhoea occurs when the secretion of pancreatic lipase is reduced by 90%. It occurs in about half the patients. The development of diabetes is more common. The steatorrhoea is often severe and the patient may notice drops of oil in the lavatory pan. Both diabetes and steatorrhoea occur more commonly with calcified pancreatitis. Less common presentations include biliary obstruction with jaundice and occasionally cholangitis. Obstruction of the splenic vein can lead to portal hypertension. This includes assessment of some of the endocrine and exocrine functions as outlined earlier, as well as visualization of the pancreas. The serum amylase is of little value in chronic pancreatitis but may be raised during an acute episode of pain. PAT IENTS WITH PAIN are investigated using ultrasound or CT scan, which show abnormalities in size and duct dilatation or the presence of calcification not seen on a plain X-ray. An ERCP is also useful in these patients to confirm the diagnosis. A dilated pancreatic duct, sometimes associated with stones or stenotic areas, can be identified. Early cases are difficult to diagnose and a combination of all tests with a strong clinical suspicion is necessary. Endoscopic ultrasound can visualize the pancreas and is being assessed. require a Lundh test to estimate exocrine function. 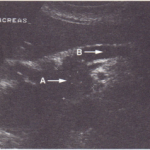 (T showing chronic calcific pancreatitis (arrow). Carcinoma of the pancreas must be suspected, particularly when the history is short; occasionally laparotomy may be necessary to distinguish between these two conditions. In alcoholic pancreatitis the patient should stop drinking alcohol. The pain needs to be controlled, often with narcotics, with the problem of addiction. Surgery is used for the treatment of intractable pain, pancreatic resection combined with drainage of an obstructed pancreatic duct into the small bowel being required. The use of surgery is controversial; good results are only obtained in a small number of cases, usually those who stop drinking. Steatorrhoea is treated with a low-fat diet, pancreatic supplements, e.g. pancreatin 2-4 g with each meal, with occasionally cimetidine 400 mg twice daily. Diabetes mellitus is treated with diet, oral hypoglycaemic agents and/or insulin as appropriate. The insulin requirement is greater than in idiopathic diabetes, and patients may experience frequent or severe hypoglycaemia. This may be because pancreatic glucagon is lacking. duct and the peritoneal cavity. The amylase content of the ascitic fluid is high. A good prognosis depends on complete abstention from alcohol.